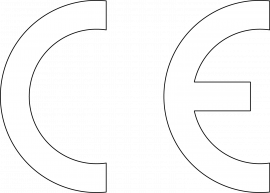 The “CE” mark indicates the conformity of a product with an EC Directive applicable to that product. It is a declaration that the product conforms to all EC regulations and provisions, and the appropriate conformity assessment procedures have been completed. Secondary cells and batteries do not create, and are not sensitive to, normal electromagnetic disturbances and therefore no immunity tests are required. Free-standing secondary cells and batteries, electrically isolated from any associated electrical or electronic systems are, for all practical purposes, electromagnetically inert and therefore the requirement for electromagnetic compatibility is deemed satisfied. It should be noted that secondary cells and batteries are normally part of an electrical or electronic system and the manner in which they are used could invoke the requirements of electromagnetic compatibility upon that system. Self-contained secondary cells and batteries free from electrical or electronic components other than intercell connectors are excluded from the EMC Directive EMC 89/336 and therefore the use of the CE mark is not appropriate and is not permitted.